I can't help but love a leopard piece infused into the wardrobe. It's sophisticated, yet slightly bold and daring. And, leopard print is very IN for Fall! I've already seen leopard shoes, boots, purses, bracelets, sweaters, blouses, and skirts for the upcoming autumn season (and I don't get out much, y'all). As with everything, moderation is key - only one leopard piece at any one time. Unless you're auditioning for an off-broadway rendition of CATS. Promise me, ok? 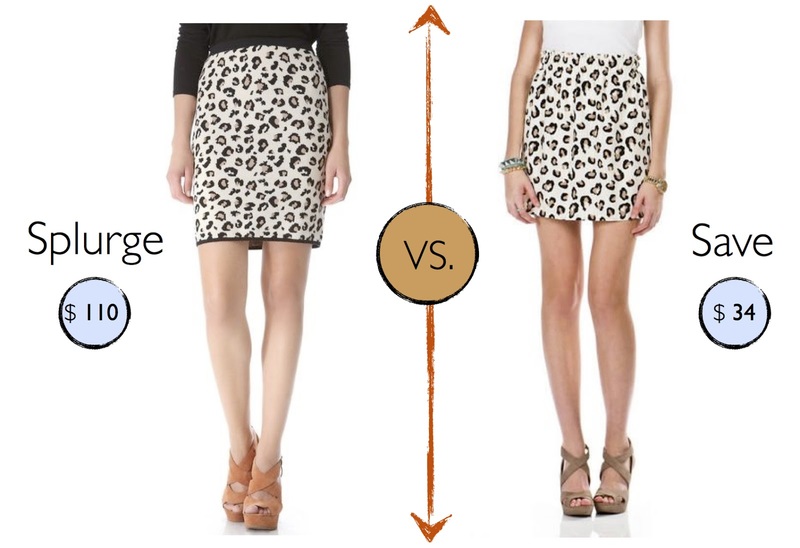 Both skirts are cute pieces that can be dressed up or dressed down for different occasions. Leopard print can even serve as a neutral of sorts, since you can pair it with a colored top, a colored bag, or a colored shoe. Just don't go mixing and matching several colors with it...stick to one added color, like oxblood or emerald or plum, and keep the rest of your palette black, white, brown, or gray. So pretty! What other Fall fashion trends are you loving? I'm also loving all the blue I'm seeing. I don't typically wear a lot of blue, but I'm really starting to fall for it lately (pardon the pun...ha ha). Peachy Keen - Are you a fan of peach decor?